Look, I don’t know what my problem is, and I’m not proud of this, but I’m sort of a racial/national/ideological/ethnic tension rubbernecker. It’s fascinating to me how many different ways mankind has found to hate one another. And I like to watch related material on Youtube (there’s no shortage). So this morning I thought I’d explore Youtube for Japanese/Korean tensions (reading up on Imperial Japan after reading an article on the Chinese setting up a no-fly zone with threats over the disputed Japanese islands got me started on this adventure), so I just typed in “Japanese South Korean” into Youtube figuring a lot of good stuff would come up. But you know what came up instead? This young Singaporean fellow, Wei Qi I think his name is, Mandarin being his first language, delivering an apparently-extemporaneous monologue to his laptop’s webcam, a medley of his self-taught impressive grasp of Mandarin, Cantonese (both considered Chinese but quite different), English, Japanese, Korean, French, Malay and Turkish. That’s a long list. Rain Man long. Dirk Diggler long. Absolutely amazing to watch someone glide through eight languages like this, and almost poetic (not really) that my love of hate, in a twist of fate, brought me to someone of dictate traits I found with my mate to be great (okay I’ll stop), his pursuits of his “hyperpolyglotism” transcends those barriers of acrimony between Mainland Chinese (Mandarin) and Hongkongers (Cantonese), between Muslims (his Turkish and Malay) and Europeans (his French), between the Japanese and Chinese/Hongkongers especially, all irrelevant to him in his selections of languages. Whereas the Japanese just cannot get enough naughty cartoons, this guy just loves languages. If you want to confuse Chrome regarding which language to offer to translate a page into, here’s his blog. Currently he is working on Spanish and Russian. 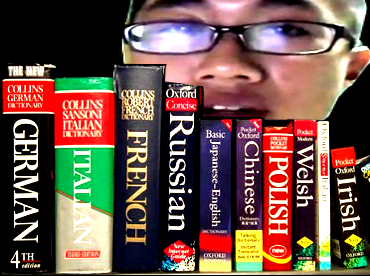 Hey Wei, don’t forget Italian. And Google, feel free to use my cathartic foray as a storyline for a commercial.